U.S. CPI Inflation surged higher during March by rising to 2.7% from 2.1% the month before, completely catching the mainstream financial press off guard that continues to take its cues from the Fed central bank deflation propaganda as part of its strategy for massaging the general populations inflation expectations and enabling it to print money aka Quantitative Easing, aided by academics who are paid to follow a school of thought rather than think independently and without any monetary consequences of being wrong which is then further regurgitated at length by salesmen and the BlogosFear. The global inflation mega-trend continues to accelerate where even the highly doctored and under reporting of true inflation official CPI, as experienced by the general populations has been breaking out of targets as illustrated by the UK CPI of 4%, Euro-zone 2%, China 5.4%, and India at 9%. Clueless deflationists ether continue to persist in their deflation delusion or try and reinvent history hoping readers won't google the facts of more than 2 years of a worthless deflation diatribe much as I warned of would occur at the birth of the recent phase of the Inflation Mega-Trend in November 2009 (18 Nov 2009 - Deflationists Are WRONG, Prepare for the INFLATION Mega-Trend ). The actual reality of the so called great deflation of the past 2-3 years is revealed by the below graph for US CPI inflation that makes a mockery of such deflation commentary. Now having led their readers down a 2 year dead end, that included worthless garbage such as that the stock market would break the March 2009 lows or that commodities would always imminently fall, are now fraudulently stating that they saw inflation coming all along and now claiming that it could rise to as high as 5%, which should send alarm bells ringing amongst readers given their actual record. The worthlessness of such so called analysis is never more illustrated than by the use of the term 'core inflation' that is utilised to this day as an argument for deflation to imply that people have stopped feeding and heating themselves as food and energy prices are excluded from core inflation. These deflation fools who have today jumped aboard the inflation bandwagon where during early 2009 were telling you that Quantitative Easing would not be able to prevent deflation and the stock market would continue to fall, they also stated that QE had ended in March 2010 and that there would be NO QE2, and today these same fools are implying that there will be no QE3, when the January 2010 Inflation Mega-Trend Ebook concluded that money printing cannot end whilst large budget deficits persist that require monetization of public debt (that includes private debt that has been purchased from the bankster's and dumped onto the tax payers at huge loss). The bottom line is this, 99% of what you read on the internet and watch on the mainstream broadcast financial press by so called analysts is actually written by journalists who just regurgitate commentary from clueless academics and central bank propaganda, or by salesmen who are clueless on the actual state of the economy and market trend expectations but instead suffer from permanent amnesia as they seek to reinvent history so as to perpetuate SALES of their books, products and services because they cannot make a single penny profit from actual trading and investing. However it gets worse because this worthless diatribe of is further regurgitated at length by the BlogosFear that drowns out to less than 1% of that which one could consider useful which is why as investors you are probably better of not listening to ANYONE on the internet, in print or broadcast regarding finance and investing due to their being a 99% probability of it being near totally worthless. The following text on U.S. debt and Inflation is excerpted form the NEW The Stocks Stealth Bull Market Update 2011 70 page ebook is available for FREE Download. CPI Inflation - UK CPI inflation has already busted above 4% enroute towards 5% having spent virtually the whole of 2010 above the Bank of England's upper inflation limit, I continue to expect the US to play catchup to the UK in inflation terms, which suggests US CPI inflation breaking above 3% this year, without doing in-depth analysis I cannot say how high it could spike to but a peak of 1.5% to 2% below the UK inflation peak rate is highly probable which on the most recent UK inflation data suggests 3% to 3.5% which is set against the most recent US CPI rate of 2.1%. Meanwhile all central banks, including the Fed will continue with the deflation threat economic propaganda (aided by clueless academics with fancy titles such as Professor of blah blah University that the mainstream press panders to which then gets regurgitated at length by the blogosfear) much as the Bank of England has done for the whole of 2010 and into 2011 that deflation was always imminent and inflation would soon fall, which looks set to be replicated in the US during 2011 as the Fed focuses on the likes of lower core inflation that excludes food and energy costs because off course, just as is the case in the UK, everyone has stopped feeding and heating themselves thus the clueless and vested interests play the game of ignore anything that actually rises in price whilst focus on anything that has fallen, such as plasma tv's, ignoring the fact that people are prioritising their consumption on the necessities rather than luxuries. The bottom line is that the US just like the UK is on a long-term trend of a stealth debt default by means of high real inflation the price for which is being paid for by all workers and savers as the purchasing power of their earnings and life accumulated savings erodes in value. Yes the US has the reserve currency advantage but as illustrated above it is burning its currency at a faster pace than the UK, which means the US is steadily losing its reserve currency advantage, so both countries are skipping along, hand in hand towards the hyperinflation cliff, when ? Not this year or next, but we'll definitely get there ..... together! So prepare and plan your finances ahead now, rather than be forced to do so at great real terms loss later on (See Inflation and Interest Rate Mega-Trend ebook's). U.S. Debt - The United States mushrooming debt mountain is feeding the global inflation mega-trend as the consequences of rampant U.S. money printing spills over into economies across the world in the form of global capital flows pushing up asset, commodity and consumer prices. Unfortunately most of the US population appears blind to the consequences of soaring public debt and liabilities (just like the UK population was under the last labour government). There is no free lunch, and the price for debt won't be paid by future generations but today's generation as the markets do not wait for children to be born, grow up and take up the debt servicing mantle but react in the present on the prospects for future default real or stealth (inflation) which is why each year U.S. workers are becoming poorer in real-terms. Everything I have iterated at length in the Inflation Mega-trend and Interest Rate Mega-trend ebook's for the UK population holds just as true for the US population that I can boil down to just one sentence (pardon my language) " The middle class of America is well and truly fu*&ed"
Your congress / government is a near total fraud! Virtually ALL U.S. politicians are in the back pockets of the bankster elite as evidence by the fact that no bankster has been held to account for their crimes against the american people. Instead they soon reverted to their old ways of paying bonuses on fictitious tax payer funded profits that they in part funnel to their co-conspirators in Congress. Instead, you the people are being forced to pay for the bankster's crimes in the form of real terms loss of purchasing power of earnings and life time accumulated savings which implies financial slavery. As individuals you first need to free yourself from the system of debt slavery by NOT partaking in it, by NOT borrowing money. Yes I realise such a notion is difficult to accept when you have been effectively brainwashed your whole life by the advertising industry and mainstream press (that is little different) that has basically been telling you its good to become a debt slave for life so that a large part of your life is spent working for your debt slave masters as you service your debt. 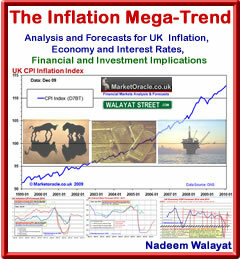 The ebook follows on from the 3rd of April 2011 publication of key analysis and concluding trend forecast for the DJIA stock index for 2011 (Stocks Stealth Bull Market Trend Forecast 2011), that includes the full detailed analysis and additional trend forecasts for the following major world stock market indices : UK FTSE100, China SSEC, India BSE and Russia RTSI. Your motivated by outrage analyst. Is silver in a bubble, inflation not withstanding? I am out of silver, and not analysed it for some time now, but real inflation during the past 2 years has been about 12%, whereas Silver is up 258% so of course its in a bubble, the only queastion is when will it burst ? Silver bubble in paper or in bullion? There's certainly a bubble in paper silver and certain ETF's but is there also a bubble in the physical bullion price ?? So far gold and silver etfs have tracked the underlying metals closely, there will probably come a time when there is serious divergence between the two. When something, anything rises by 258% in 2 years that implies a great deal of volatility, and Silver has always has been very volatile. Any view on what Bernanke will say today and how the market will react? It is worthless central bank propaganda, much as Mervyn Kings are, not worth my while to consider its contents off, though the financial press talking heads will fuss over it for many days. Like Nadeem says, it's a total waste of time to listen to these people. They only ever tell what they want to say; the truth has nothing to do with it. Even if they appear to let something slip, how do you know it was a genuine slip? These people are tricky, they're shifty, dishonest and nothing pleases them and their governments more than wrong-footing speculators and making us take a hit. They LOVE that. Don't bother listening to a word they say.